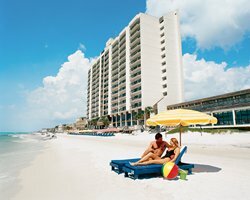 Bask in the sun of Panama City Beach at Landmark Holiday Beach Resort. Boating, fishing, swimming, snorkeling, and skin diving are all within minutes of the resort. 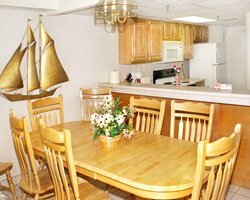 On site, you'll find a heated indoor pool, whirlpool, dry-heat sauna, and lighted tennis court. Barbecue and picnic areas are also available. Popular sight-seeing attractions include Gulf World Aquarium, Shipwreck Island Water Park, and St. Andrews State Recreation Area. You can visit Zoo World year-round. Some attractons are seasonal and are closed between Oct. 1 and Feb 1.
queen bed, 2 double beds and 1 sleep sofa. queen bed,4 double beds and 1 sleep sofa. The Main Living Area To The Master Bedroom. Accompanied By A Parent. This Includes Guest Certificates. For Points Inbounds Are $46 To $61 Depending On Unit Size. Cluttered. Parking Is Limited, One Space Per Unit Allowed. Bedroom Units Is Through The Master And Twin Bedrooms.